Toddler comforter set includes: 1 toddler comforter, 1 flat sheet,1 fitted sheet and 1 pillowcase. 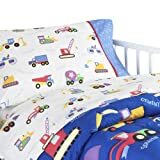 Toddler comforter :42×58″ Flatsheet: 48 in x 70 in, finished. Fitted sheet: 28 in x 52 in (fits crib sized mattress) Pillowcase: 30 in x 20 in. This entry was posted on Tuesday, November 23rd, 2010 at 9:17 pm	and is filed under Quilts for Kids. You can follow any responses to this entry through the RSS 2.0 feed. You can leave a response, or trackback from your own site.